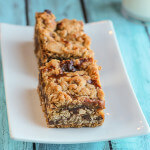 Crispy, chewy, gooey, heavenly Hazelnut Carmelitas are some of the best bar cookies made in my kitchen. 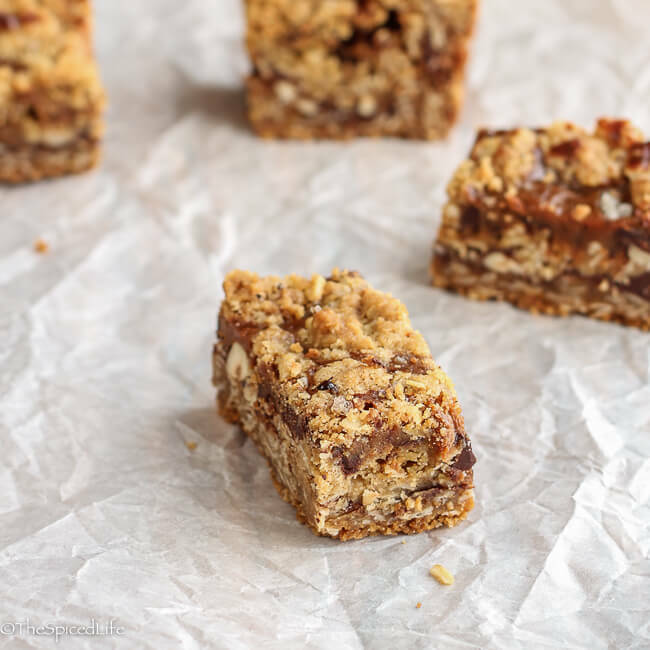 I would have shamelessly taken any excuse to make these cookies again, so when I decided to start beautifying breathing new life into some old dishes, my Hole of Shame Hazelnut Carmelitas were at the top of the list. Posted in 2009, the pictures are not terrible–I was working in a good porch room with natural light in an old residence after I had learned what a macro button was, but it was before I owned a DSLR or made any attempt at plating or staging. So it was definitely worth taking some new pictures. My recipe is adapted from Louis Lambert, and his can be found in Food and Wine. Since 2009 I have discovered salt on my sweets so I added some coarse grey sea salt on top of the bars. I also split the oat crumble topping up a bit differently this time around, but really either way will work. As it happens I am not any better at following my own recipes than anyone else’s! 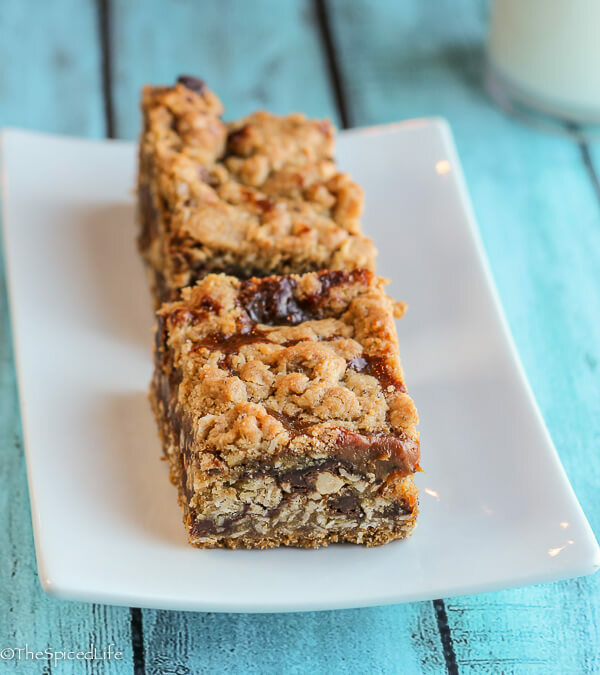 These bars make a ton–be prepared to share! Preheat the oven to 350 F. Line a 9-by-13-inch metal baking pan with parchment paper. In a large mixing bowl, whisk the flour with the baking soda and salt. Add the oats and brown sugar and mix until combined. Add the butter and mix on the lowest speed (or by hand) until the butter is uniformly mixed in–it will remind you of crisp topping, quite buttery and clumpy. Pat half of the oat mixture into the prepared baking pan. Bake for 15 minutes. Scatter half of the chopped chocolate and half of the hazelnuts over the crust. Drizzle half of the dulce de leche mixture on top of these. Crumble half of the remaining oat mixture evenly into the pan. Pat it gently, so that it is level but not smashed in. 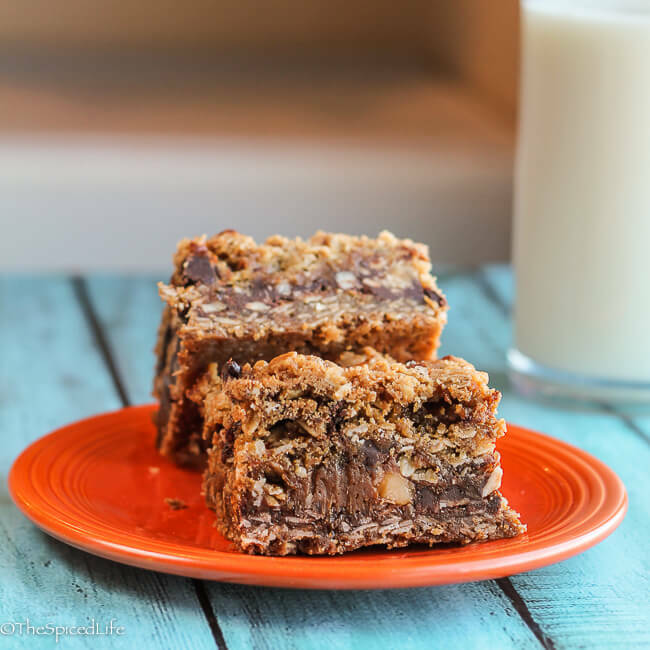 Cover this second layer with the remaining chocolate, oats and dulce de leche, in the same manner as the first layer, ending with the remainng oat mixture. Sprinkle with the coarse sea salt before lightly patting. Bake for about 35 minutes, or until the edges are set. Let stand uncovered at room temperature overnight. After slicing the next day, store tightly sealed. 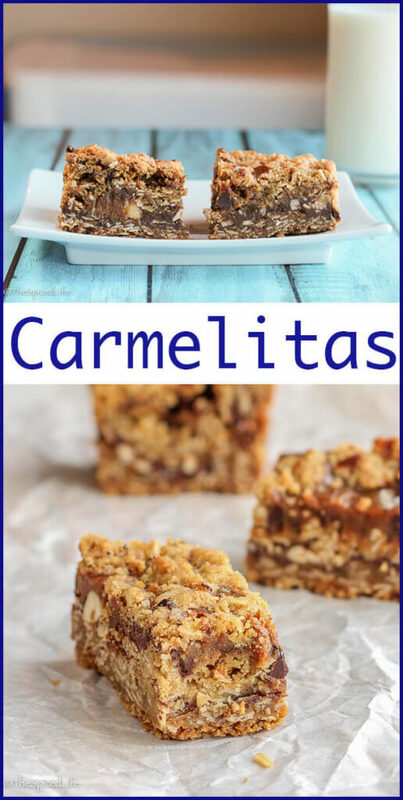 These Carmelita’s are gorgeous and I love all the photos but the Orange plate is also my favorite! Would you believe I’ve never had a Carmelita?! I really need to fix that. 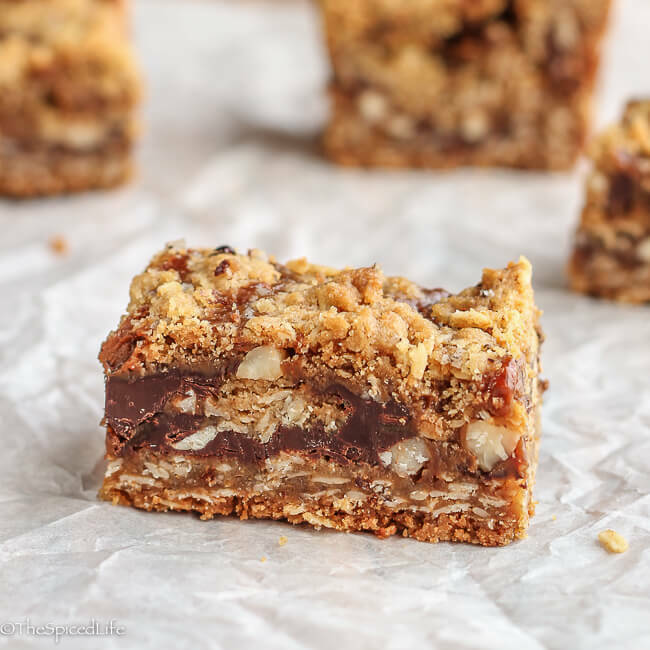 Yours look perfect, I love that they have hazelnuts and are topped with sea salt! Gorgeous pictures too. I LOVE the crumpled parchment paper look, but I also really like the orange plate for contrast! And WOW do these sound good. i’m really glad you reposted them, so that I can actually remember to try them! I like the crumbled paper, it adds texture! I need to revisit some of my old posts too! Aside from the recipe itself looking delicious, the new staging with the parchment paper is genius! It’s one of those head slap moments of “Doh! 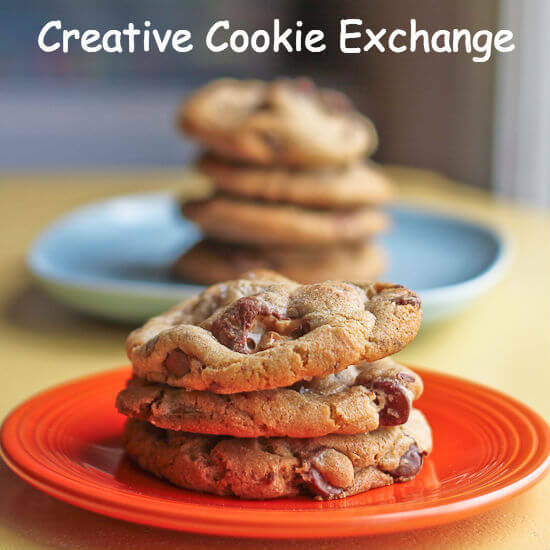 Why didn’t I think of that?” I may steal that and use that for my next baked good posting! I think both sets of pic are great, but I do love the crumpled parchment – and of course the bars look amazing! I have eaten many pans of caramelitas. Yes, I eat them by the pan. I’v never tried them with chopped hazelnuts though. Darn. Guess I need to make a pan. Of course, I’ll also hide them somewhere so I can eat them all by myself. And I loved the crinkled paper. It really highlights the bars while still providing texture. No distractions. Just the food. Love it. I am all about the caramelita! They are kind of like the perfect dessert. and I love the hazelnut twist! Excuse me while I wipe my computer screen off from the drool. These are everything I love!!! Seriously!